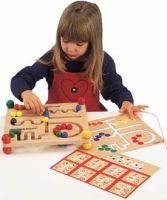 The award winning Pathfinder encourages children to develop eye-hand coordination by moving multi-colored beads along the varied, colorful routes, while using pattern cards! So encourage your child to fine-tune their logical thinking and visual tracking skills while participating in adventuresome play with the Pathfinder. Ages 3+.